it's only the Lord expanding you to fit your new beginning! It's being done from the inside out! Let Your soul Praise the Lord! Let your Spirit and Heart Praise our Mother Father God In the name of Jesus! Appreciate Her, Stop and Praise Her Now! Praise Him for things in the past you have not finished praising Him for! For things in the Future that you have not gotten to yet! Stored up Praise is what I call it! Praise God for things She's done Right Now, but you didn't empty yourself of His Praise Yet! Many people do not realize that they Are within one or more new beginnings that they actually asked God for. But, they don't look like what they thought it would, so they keep waiting on what they think it should look like. 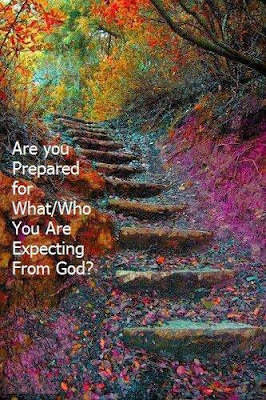 When we ask God to make us into, take us out of, put us into, change us, etc...at that point of asking, we are to allow ourselves to be positioned to be prepared for everything God has planned to do to us, for us and in us. What God has done is always going to be Better than what we ask for. When you realize that you are within new beginnings, please remember that as soon as you step into it, there is work to do. There is always Work to do when a breakthrough occurs. When something ends and something else begins, there is always Work to do. It will be an equal balance of spiritual and natural Work. the more time you give to Sitting in His presence, the more you will grow, mature and have understanding, the More God can Prepare you! You will realize, understand and begin to utilize more often the adequate portions that God has supplied to you, you will not hinder yourself! It's another place of separation. Many things will have to be left to the way side, no longer useful because, they are no longer needed. Some of those things were never useful, we just didn't see that, and had some kind of hold on it and made ourselves believe that we needed those things what were not useful from day one. In this expansion that God is doing Now, as I said, it is within us first. You are being separated from some things, some people, some thinking and actions and re-actions that will hinder you from here out. We are being made into the vessels that are pure and worthy to be Used to channel His Power! Stretched and prepared to Fit into the New Beginnings, being consecrated unto Him. If we are not Kept by God's mighty power, because we don't trust God enough to completely surrender to Him, then you cannot be used as one of His vessels to channel His Mighty Power. It's the vessel and the channel, what they are made of. that is important to the Lord. If they (we) have not been through the refiner's fire, then they (we) have junk and gunk attached to them (us), and will not-can not use God's Power as is intended. We each have to examine and ask ourselves, How long have I been trying? At what point will I begin to grow, mature and trust the Lord, then Do? It's time to actually Do. Stop saying I'm trying to, and simply Do! A stance on "I'm trying" is a way into useless and empty activity. Folk use "I'm trying" as an excuse Not to do the Work we have to do, Our part of what is necessary. Usually it's about shallow and immature faith and trusting God. A Lot of people do this, dead works is another name for it. They will not abide by what the Lord leads them to do, but will find some busy work and say it's for the Lord. They are doing some kind of work, but it has no Power. We cannot ignore The call to Come and be made ready, and think we don't need to be prepared by the Lord's Spirit. Then go out in His Name and attempt to do His Work. It's because too many are stuck at "I'm trying", and not trusting by the grace that has been provided to simply Do. We are being Called to mature and grow so that we Can walk More within The Spirit and not the world, nor in religion. Whose Kingdom will you live within, love within, work within, the Lord's or the world's? New Beginnings are upon us, we are within them. Let the Lord do His Work in you. Let the Holy Spirit of God do His Work in You! in the name of Jesus, All glory be unto God alone!